Flying Point predicts 2016 will be the year of the influencer. What started as a small tactic to increase brand awareness has transformed into a major social strategy that drives not only brand visibility, but social revenue and industry credibility as well. 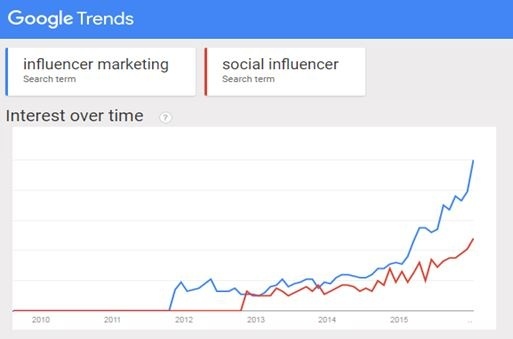 Towards the end of 2015, you can see the powerful impact influencer marketing was having on search terms and trends. But what exactly is the value of influencer marketing aside from having bloggers promote your brand or products? What are the implications brands can see from influencer marketing campaigns? And lastly, how can brands successfully identify influencers to utilize on social media and other outlets? How Do Influencers Affect Change? How Can Brands Turn Everyone into Lovers and Wearers of Army Pants and Flip Flops? A recent EConsultancy study reported that 59% of brands said their influencer marketing budgets will increase this year. So, start cranking out your inventory and get your metaphorical army pants ready. Recent studies show the evident impact of influencer marketing on consumers, specifically when it comes to their purchase decisions. 68% of consumers trust online opinions from other consumers, while 47% of U.S. readers consult blogs to find new trends and ideas. The opportunity to reach millennials through influencers is growing daily. Consumers under 32 spend 30% of their social media time digesting peer written content, and 20% of women will consider purchasing products supported by influencers. In 2015, retail giant Lord and Taylor worked with 50 influencers and asked each of them to share an image on a specific day of themselves wearing a new dress on their website. Hours later, the retail giant sold out of the dress. Almost 60% of fashion and beauty brands have an influencer marketing strategy in place, while a further 21% plan to invest in it over the next 12 months. We know influencer marketing works for fashion and beauty brands, but who else is playing with this strategy? AdWeek published an influencer marketing report that breaks down how different industries are using influencers. We Know We Should Be Doing Influencer Marketing, But Where Do We Start? 84% of influencer research is done by identifying social media accounts and online blogs using tools anyone can access. However, there are plenty of influencer marketing tools to use. One of our favorites for beauty and fashion influencers is iFabbo. Other tools to check out are BuzzSumo, Niche, and BlogLovin. 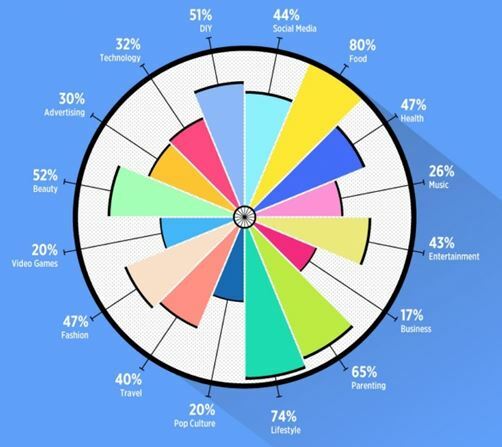 All these websites use different algorithms to target influencers within different categories by social rank, following, and more. Many of the sites even offer communication capabilities so you can manage all your interactions within the platform. Although, 85% say email is the most effective channel to reach influencers, so don’t worry if your budget cannot include the costs of new platforms. When crafting your strategy, remember a few important details. 72% of brands agreed that relevancy of influencers is far more important than the influencer’s actual reach. For example, a diet brand may have an opportunity for a major celebrity to showcase their brand on their website or discuss their products at a major event. But if the mission and vision of the company doesn’t align with the image and values of the celebrity (i.e. they’re a partier, drink often, and don’t consider their health and wellness their first priority), then the star quality of the influencer doesn’t matter. There are more benefits than one for using influencers. The more backlinks you can generate that send potential customers to your website or to your social media properties from influencer blogs and social posts, the merrier! If increasing your organic search and sales are important to your brand, then this is a tactic you can’t do without. Sharing content through influencers in your industry increases conversion anywhere between 3-10 times, but those numbers deflate when you aren’t specifically identifying backlinks your influencers need to include. This key part of your SEOcial strategy often gets overlooked. If you are working with an influencer and you are looking for backlinks, be explicit and direct when giving them instructions. Although you want your influencers to speak in their voice in order to make sure their audience is engaged with their content, it’s important to make sure their delivery of your brand’s information (whether it be a product, contest, or campaign) fits your brand guidelines. When integrating influencers into a product launch, consider giving them premeditated statements and necessary words to include in their copy. They will not mind if they have to do a little copy and pasting. Consumer Education: How well are your influencers teaching consumers about your product or brand? Social Following: Are your influencers’ followers migrating to your social accounts? Sales: Reviews and endorsements sell more products! 69% say product launch is top priority when working with influencers. User Generated Content: Were you successfully able to capture user images and posts to reuse in your content strategy? SEO Authority: How many backlinks were you able to gain? It’s important to understand that you aren’t using influencers for your brand’s own good, but rather cultivating relationships with the movers and shakers in your retail space. 44% of influencers decide to work with a brand because the opportunity is relevant to their own audience. For larger bloggers and social media stars, their number one goal is to grow their following. Offering influencers the opportunity to launch giveaways and sweepstakes receives more earned media value and engagement than any other tactic in influencer marketing. Influencers agree to review and give away products because they identify these tactics as well received by their audience. Providing influencers with free products, saying thank you (use your manners! ), and engaging with them on social media through your brand are often enough to maintain strong relationships. 88% of influencers tell friends about the brands that sponsor them and 72% share additional posts about their sponsors outside of any contractual agreement, further proving the importance of cultivating positive relationships with your partners.